There was much excitement during Digestive Disease Week conference about positive phase 2 study results for a biologic drug called AMG 714 in celiac disease. One of the big issues in the disease is accidental gluten contamination of food, leading to symptoms in a large percentage of patients, even when they are following the gluten-free diet. AMG 714 is being developed as an adjunct therapy to the gluten-free diet, with the intent to reduce symptoms and gut inflammation. 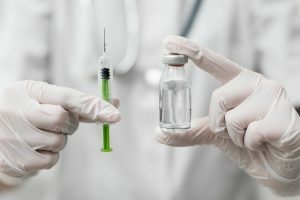 In the phase 2a study, three groups of patients were involved in taking injections of AMG 714 every two weeks over three months. One group was taking a dose of 150 milligrams of the experimental drug, another was on a 300-mg dose, and another was only receiving a placebo drug. Similar to insulin, the patients were taught how to self-administer the shots. During treatment, a subset of patients was challenged with high amounts of gluten in their diet (2.5 grams per day over 10 weeks) while testing showed others were already getting hidden gluten exposure in their own diets. The group getting the high-dose challenge fared the best, according to researchers Dr. Marklu Maki, from the University of Tampere in Finland, and Dr. Francisco Leon, representing Amgen and Celimmune, the companies developing the drug for celiac disease. The pair told the June conference in Washington, D.C. that the drug showed a statistically significant reduction in symptoms and inflammation, although they were still seeing mucosal injury in the small intestine. The AMG 714 antibody blocks the cytokine interleukin 15 (or IL-15), which is an important driver of inflammation in the gut. The next step for AMG 714 will be a Phase 2b study, which will look at using higher dosing levels over a longer timeframe. The investigators also plan to study if the shots could be taken less frequently, perhaps monthly. Leon notes that gluten contamination “is known to occur very frequently” in those following a gluten-free diet. This is due to a variety of factors – including cross-contact during food processing or cooking or sometimes inadequate package labeling. “Our hope is that this drug may allow celiac patients on a gluten-free diet to experience fewer gluten-triggered events,” he said. A related study of AMG 714 for refractory celiac disease, a rare and severe form of the disease that can lead to lymphoma of the gut, also showed promising results. Digestive Disease Week is an international gathering of physicians and researchers in the fields of gastroenterology, hepatology and endoscopy. See more here.